Arnica flower is also known as Leopard's Bane, Wolf's bane, Mountain Tobacco, Mountain daisy and European Arnica. The plant and flower contain many active ingredients including compounds and volatile oils. The herb is believed to help increase circulation and helps reduce both pain and swelling from all minor injuries and postoperative swelling. Arnica is also touted as a means of relieving the pain from muscle soreness and sprain-related pain. You can apply the tincture directly to the skin, adding it to water for external use. Arnica Montana is a natural anti-inflammatory and has been used by herbalists to reduce the symptoms of rheumatic pain, and swelling due to fractures and insect bites. The herbal tincture has been used as a soothing foot bath. One of the most common uses of Arnica is the treatment of bruises, sunburn and other forms of skin irritation or inflammation. Do not apply on an open wound. 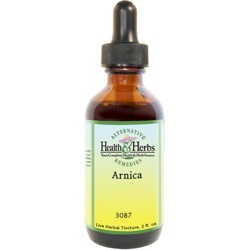 Arnica flower remedies have been used to help minimize the effects of tissue trauma and to assist the healing process. It is even believed to prevent bruising by stimulating the white blood cells and dispersing trapped blood and fluid from the site of the injury. The flower extract is known for its ability to speed the healing of tissues by improving blood circulation and helping the oxygen to get to the cells quicker. This herb is a suitable remedy for the treatment of all injuries resulting from impact, falls, stabs and cuts. Used topically, it is touted as an excellent way to speed up the healing of bruises and sprain, and it is used as an alternative treatment for sports-related injuries of this type Arnica is useful for bruises, sprains, muscle aches, contusions, acne, superficial phlebitis, rheumatic pain, inflammation from insect bites and swelling due to fractures. Arnica, in a cream, is also used to treat the pain and inflammation resulting from carpal tunnel syndrome, joint pain, and arthritis. It has also been used to relieve back pain and abdominal pains. Trauma to muscles through exertion or injury, have also been found to be reduced through the application of Arnica in an ointment or cream. After pregnancy, women may find relief in the herb, especially for stomach muscles. This multi-dimensional herb may even help emotional trauma and depression as well as poor blood circulation and incontinence. Arnica Montana flowers contain sesquiterpene lactones, flavonoids, carbonic acid, coumarins and volatile oils, all of which are beneficial for the skin. A sesquiterpene lactone, called helenalin, is the main restorative compound in Arnica, which helps soothe and renew the skin after exposure to stress. In the hands of natural beauty buffs, Arnica flower tinctures are becoming something of a medicine cabinet and vanity must have. The herb clears up acne and other skin inflammations. Its antibacterial and anti-inflammatory effects benefit those with inflammatory skin disorders. This herb is traditionally used as a topical treatment for burns, eczema and chapped lips. Arnica should not be applied to an open wound, as it could cause painful irritation. Arnica in ointments can significantly improve frost bites, as long as there are no open wounds. Medications from this plant are often thought of as preferential treatments for leg ulcers in diabetic patients. Arnica contains a derivative of a substance called thymol and has been clinically shown to be an effective vasodilator, as well as an anti-bacterial and fungicidal. What makes this substance unique is that unlike the antibiotic and anti-fungal medications used in mainstream medicine, thymol does not contribute to resistant mutations of bacteria. Arnica is often used for hair care because of its anti-inflammatory properties which can control dandruff and promote hair growth. Arnica extract can be safely used on hair at a concentration of 1 to 2 percent. A hair rinses prepared with Arnica extract has been used to treat alopecia neurotica, an anxiety condition leading to hair loss. This herbal tincture acts as an antibiotic which can help treat an infection on the scalp. The use of Arnica in hair treatments rejuvenates the scalp and also stimulates the hair follicles, which in turn will strengthen the hair and keep it from falling out prematurely. Arnica herbal extract may also prevent premature graying of the hair. Arnica tincture, if consumed can be toxic. Signs of toxicity are vomiting, weakness, increased heart rate and nervous disturbances. Ingredients: Arnica Flower, Structured Water, 20% Alcohol. Non-Alcohol: Arnica Flower, Structured Water, and Vegetable Glycerin. Instructions: Use 6-12 drops in juice or water or under the tongue. May be taken three times daily. Store in a cool dark place. Keep out of reach of children. Do not use on open wounds. Contraindications: Arnica is generally safe when used topically (externally). However, prolonged use may irritate the skin, causing eczema, peeling, blisters, or other skin conditions. Arnica should not be used on broken skin, such as leg ulcers. Also, people who are hypersensitive or allergic to the herb should avoid it. Do not take Arnica internally. It may cause dizziness, tremors, and heart irregularities. It may also irritate mucous membranes and cause vomiting. Do not take use more than the recommended dose as large doses may be fatal. If you are pregnant or breastfeeding, consult your health provider before taking any medication, including herbs. When used topically, Arnica does not interact with any conventional medications. From Sharon Krug of Angola, New York on 11/13/2016 . From Oederski of Portsmouth, Virginia on 3/3/2016 . From Kenneth Orders of Portsmouth, Virginia on 2/28/2016 . From RITA SUPER of Portsmouth, Virginia on 8/30/2013 .